Political Analysts Alajdin Demiri and Petar Arsovski comment in Koha that the Name Issue is even more distant and FYROM’s government does not truly want to solve the issue. The latest statement of FYROM’s PM Nikola Gruevski that Greece needs to obey the decision of the International Court of Justice in Hague is nothing new. But according to the analysts it concretes the diametrically opposed positions of the two countries involved in the dispute and risks a solution of the Name Issue. They accuse the Government in Skopje playing a game of “hot and cold”. A game which it is meant only to buy time and find the culprit before the public, while wont actually solve this problem existing for two decades between the two neighboring countries. ” The intention for the imposition of the Hague’s Tribunal as a strong decision, is a continuation of the unsuccessful maneuvers in order not to reach a solution, plus Athens to be shown as the main culprit”, states Alajdin Demiri. He also adds that it is known beforehand that the Hague court has no decision making power, but it is a morality, a procedure that produces no effect. 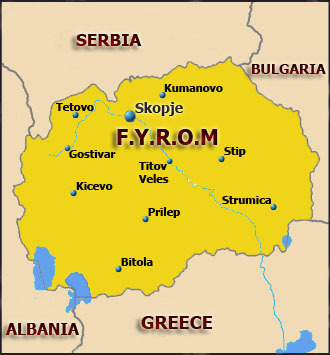 The aim that this motif is used regarding the name issue is buying time for FYROM’s government. Arsovski adds that they need a debate on whether they truly want to solve this issue or finally realize that they do not have capacity to be part of this process.“I see the tactics and the latest statements of the Prime Minister as a continuation of the hot and cold game,” said Arsovski adding that FYROM lost valuable time with a more flexible Greek government.